New In The Parts Department! Nothing could be easier to buy or easier to send than a Ducati Indianapolis Gift Certificate. Available in any amount, this takes the guess work out of gift giving. We stock a full line of locally produced Ducati Indianapolis apparel! We have hoodies, tee-shirts, hats, beanies, socks, shorts, and even wrist bands. There's something for everyone! Call John for more information at 317-603-8587 or email: john@indyducati.com. We're your chain and sprocket specialists! Whether you want to change your gearing, save some weight, get the best value, or just know whether it's time to replace, our parts and service department make it easy. Contact John at 317-337-1098 or john@indyducati.com for more details. 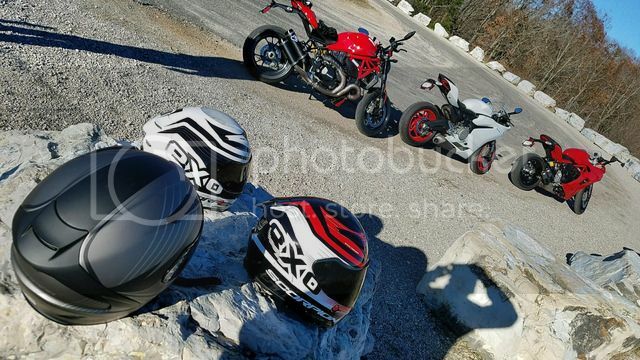 New at Ducati Indianapolis: SCORPION HELMETS! We're proud to be able to offer our customers the full range of Scorpion helmets and riding apparel. The Scorpion EXO-R2000 offers four shell sizes, Snell approval, fiberglass and aramid construction, Airfit interior, aero-tuned ventilation, and even includes a smoke shield! All for under $300.00! Stop in today to see why Scorpion is the best value in motorcycle helmets and why every member of the Ducati Indianapolis team wears one.